The 9A-6 champion Timber Creek Wolves. 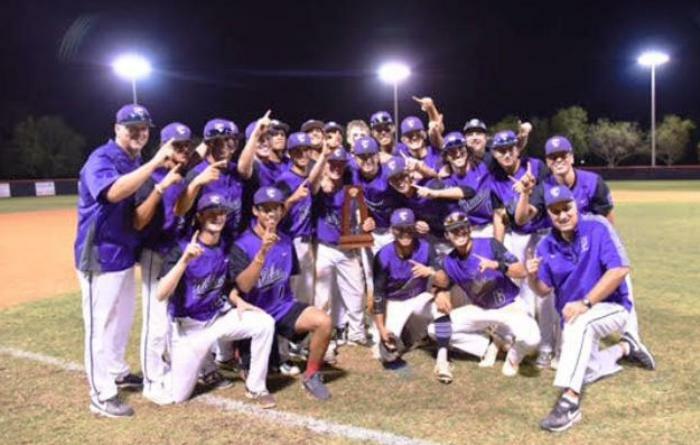 An eight-run sixth inning reversed the fortunes of the Timber Creek Wolves on Friday night, pounding the way back to a 14-10 victory that earned them the 9A-6 championship. Trailing by two runs entering the frame, Timber Creek (20-7) sent 12 batters to the plate during the comeback. An RBI groundout from Arnie Ruiz drove in Isa Mamudoski with the deciding run. Both teams already earned a berth into next week’s regional playoffs. Timber Creek will host Gateway and Oviedo (15-11) will travel to Haines City, in regional quarterfinal action on Tuesday night. Both clubs will carry hot bats into those playoff games, as the two sides combined for 26 hits in Friday’s title game. Cameron Meehan led Timber Creek by going 3-for-3 with a double, a stolen base, four runs and four RBIs, and Ruiz went 2-for-5 with a double, a stolen base and three runs. Every starter reached base, and Marcos Roque also had a multi-hit day in going 2-for-3 with two RBIs. Nearly every starter also reached base for Oviedo. Nick Sala led the way by going 4-for-5 with a double, a run and six RBIs, and Dawson Dannecker went 3-for-5 with a double and three runs. Scott Reeves went 2-for-5 with a home run and two runs.